209 NYC Dental (New York) - Book Appointment Online! 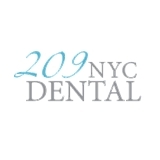 Welcome to 209 NYC DENTAL nestled in the heart of midtown New York. We are the oldest continuing dental practice in New York State. We were established in 1887. This legacy of treatment comes with responsibility. A responsibility to treat people with respect, excellence, and compassion. We treat people not teeth. CANCELLATION POLICY: In an effort to provide the best quality care we have instituted the following policy. A cancellation is considered to be valid when the office receives 24 hours advance notice. very nice office, nice staff, great experience with the doctor and technician. Everyone at the office was great. Very pleasant experience. Doctor Wang was cool, kind, and knowledgeable.